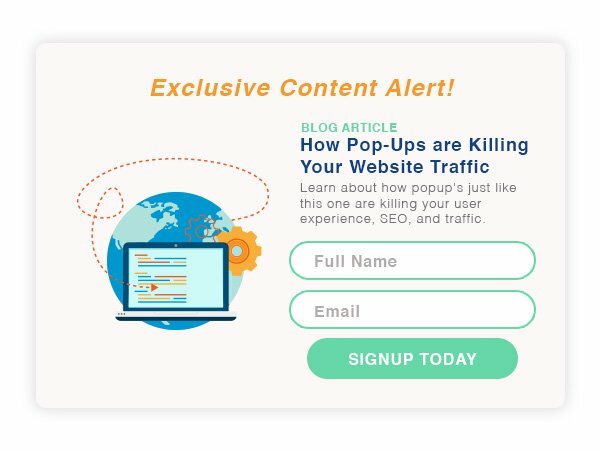 There are about 5,000 articles from 2008 and beyond trying to convince you to add obnoxious popups for everything from email signups to promotional coupons. We are going to take a stance and write an article about how popups are killing your website traffic. 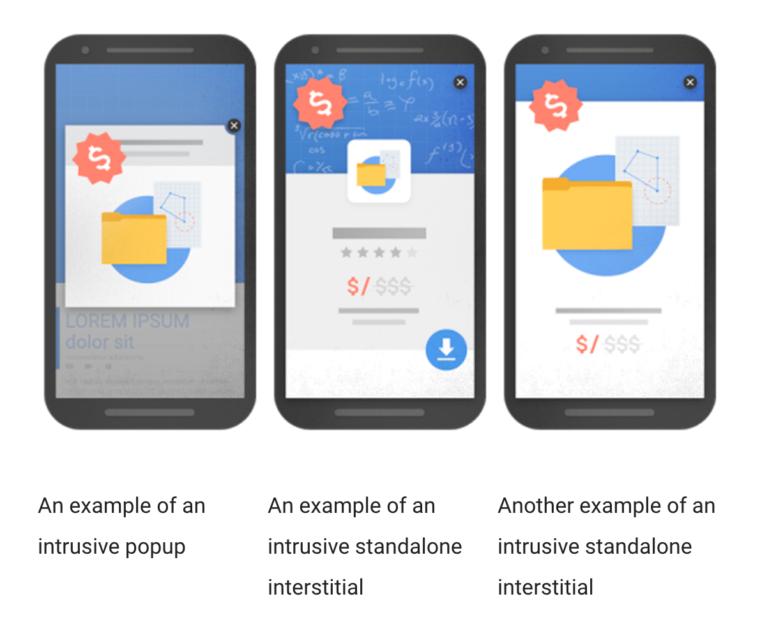 What is an Interstitial ? A popup is what marketers refer to as an interstitial, by definition an interstitial something that interrupts sequential content weather it be a video a blog article or your home page. So why is this important ? Well Google has classified and called out interstitials as a factor that goes into their ranking algorithm in a 2016 webmaster tools blog post . The blog post more or less say that pop ups that are unprompted negatively affect user experience therefore your seo. How does a Pop Up effect my user experience? Users have an incredible distaste for popups, after all look where the internet was just 6 years ago when popups were more associated with malware and viruses then they were with opt-in forms and email signup prompts. This distaste come from an almost instant reaction to be fearful or cautious of any kind of poup which eventually lead to resentment and anger. After years of conditioning we have been trained to instantly click out of popups and in a lot of cases leave a website if we are presented with one without initiating it. When you look at the analytics this ends up creating an extremely high bounce rate the more intrusive a pop up appears to be. So what should I avoid ? Now that you know the errors of your way and you are ready to start providing a good user experience for your website visitors you should try to avoid the below items that make your content less accessible. Deceptive page layouts whose above-the-fold portion looks like an popup or notification. Standalone popup that must be dismissed before users can access your content. Classic interstitial ads and splash ads that interrupt users as they navigate between pages and/or before they reach your homepage. New window pop-ups that open as soon as a user clicks on your page. Welcome mats, new window pop-ups, and other intrusive ads. Overlay modals that are difficult to close and/or easily redirect visitors who accidentally click on them. Intrusive lightbox ads and pop-ups. Below is a few examples that Google provided showing some of the above examples. But I really really want a popup! Ok you are really intent on serving a popup to get a user to signup for your mailing list or to provide some kind of coupon code? There are ways to do this but you need to follow a few really important best practices. Make sure your popup does not display on mobile. Make your popup as non intrusive as possible by only taking up 15% of your screen. Time your popup’s so they appear after the user is done reading their content so it does not interrupt. Exit Intent popups in an article by SEJ they have confirmed pop-ups triggered by exit intent aren’t punished by the new update. You will still need to add a no-index tag in the code for though. Make the popup as contextual as possible meaning you should never ask for someone to signup for blog updates if they have not read your blog yet. Only serve a popup once per session and try not to serve the same pop for at least a few weeks to the same person. We know exactly what you are thinking by this point which is “But every other website I visit is doing this”. That may be so but they are being penalized whether its with higher bounce rates or Google rankings it may not be drastic today but Google will eventually take a harsher stance on this.